All Preowned consoles sold by EB Games have undergone rigorous checks by our refurbishment team to make sure the console you purchase lives up to the awesome standard our customers expect. 40% smaller. 500GB of storage. Internal power supply. Play the greatest games lineup, including Xbox 360 classics, on a 40% smaller console. 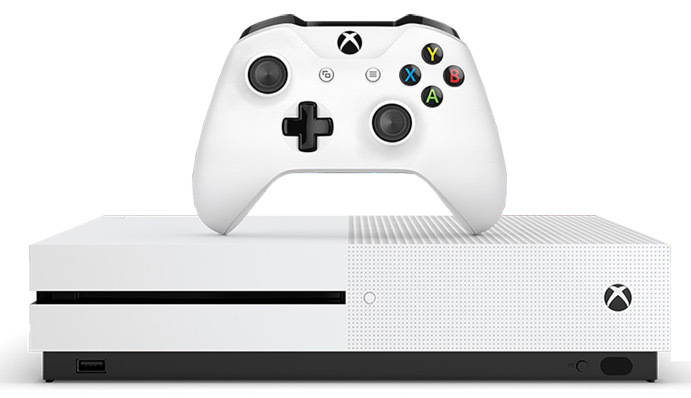 Just don't let its size fool you: with an internal power supply and up to 500GB of internal storage, the Xbox One S is the most advanced Xbox ever. With four times the resolution of standard HD 4k Ultra HD delivers the clearest, most realistic video possible. Stream 4k content on Netflix and Amazon Instant Video and watch Ultra HD Blu-rayTM movies in stunning visual fidelity with High Dynamic Range. Configure your Xbox One S to turn on other devices, like your TV, audio/video receiver, and cable/satellite receiver. Whether you're playing a game or watching a movie, the integrated IR blaster will get you to the action faster, allowing you to leave your remotes behind.